With the enormous success of the three Lord of the Rings movies, I also suspect many have lost sight of how chancy an enterprise the series was. In fact, the Rings trilogy may well be the ballsiest production in recent history. New Line committed about $300 million to the creation of the three films before director Peter Jackson filmed one frame. He shot all three flicks in one massive 15-month period, so if Fellowship tanked, the deal was already done. Given the fairly modest resources at New Line, a flop could potentially have killed the studio. That clearly wasn’t the case. All three made tons of money and earned great critical praise. 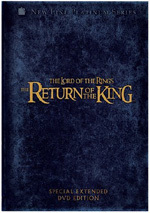 The third flick – 2003’s The Return of the King - even won the Oscar for Best Picture, something exceedingly rare for a film of this genre. Upon my subsequent assessments, I felt better able to enjoy Fellowship for what it offered. I can’t call it a flawless movie, though it does very well for itself. Most of the film’s weaknesses occur during its first hour. While much of the flick includes a great deal of exposition, the initial act really tosses out a lot of detail, virtually all of which becomes important down the road. Director Peter Jackson shows this information in a stylish and clear way, but the sheer amount of material makes it a little tough to take. I also could live without all of the moments in Hobbiton. Of course, these scenes are essential to set up Frodo, Bilbo, and some of the others, and the movie wouldn’t function as well without them. However, most of the film’s cutesy moments appear during this area, and I think the Hobbiton parts - necessary as they are - move somewhat slowly. While Fellowship includes many strong elements, Jackson ties the whole thing together with a terrific sense of style and an authority that makes the project coalesce neatly. The many action scenes seem especially excellent. The material flows naturally and Jackson creates a vivid and vibrant series of fight sequences that mesh together wonderfully. He doesn’t do anything unique, but these scenes nonetheless appear fresh. The Lord of the Rings: The Fellowship of the Ring appears in an aspect ratio of approximately 2.40:1 on this Blu-ray Disc. Though no serious issues emerged, I thought the presentation seemed a little less impressive than expected. Sharpness became my only area of mild complaint. While the majority of the flick looked crisp and distinctive, wide elements sometimes lacked great fine detail. This issue wasn’t a constant, as some broad shots looked tight, but more than a few seemed just a bit soft. Overall definition remained very good, however. Jagged edges and moiré effects created no concerns, and I also detected no signs of edge enhancement. Source flaws remained absent and never cropped up in this clean transfer. Fellowship enjoyed a stylized palette that varied dependent on the location. For example, when we entered elf territory, the film adopted a heavily golden tone, and other climates might strongly desaturate the image. The colors always remained nicely vivid and vibrant, and they showed no problems related to bleeding, noise, or other concerns, even when we entered some red-dominated areas. Black levels came across as deep and dense, while shadow detail was appropriately heavy but not overly thick. The occasional instances of softness knocked this down to a “B”; I almost gave the image a “B+”, but I found too many slightly ill-defined scenes for my liking. The DTS-HD MA 6.1 soundtrack of Fellowship was more consistent, though it came with one minor concern: heavy bass. The original DVD came with overwhelming low-end throughout the film, and some vestiges of that still appeared here. This was especially true in the early moments, as I thought the prologue suffered from bass that threatened to overwhelm the story. Unlike the old DVD, however, the track became more balanced pretty quickly. Most of the film displayed low-end that was still loud but not as oppressive. Bass still occasionally veered toward the excessive side of the ledger, but I thought it was appropriate most of the time. The soundfield offered a wide and engaging piece. All five channels received active usage throughout the film, and they created a nicely vivid and life-like environment. Music showed fine stereo presence, while effects appeared from all around the spectrum. Those elements blended together neatly, and they moved cleanly from speaker to speaker. Surround usage was effective and accurate without becoming overwhelming or gimmicky. None of the film’s scenes stood out to me as anything particularly noteworthy, but the package mixed together to become a fine and seamless whole. Audio quality seemed strong. Dialogue sounded natural and crisp, and I noticed no problems related to edginess or intelligibility. Music was bright and vibrant and displayed positive range. Effects appeared clean and distinct, and they lacked any signs of distortion. Except for the early examples of too heavy bass, I thought this was a stellar track. How did the picture and sound of this version compare to the original DVD from 2002? Both demonstrated improvements. As I mentioned, the old DVD suffered from overwhelming bass, so the Blu-ray provided a better balanced track most of the time. It also showed a bit more clarity and smoothness. Though I found a few issues with the visuals, they still significantly improved on DVD. Even with the smattering of soft shots, the Blu-ray’s increased resolution meant it was virtually always tighter and better defined. Colors and blacks were also more impressive. The Blu-ray’s image wasn’t the slam-dunk I expected, but it demonstrated a good step up over the DVD. The Blu-ray replicates the supplements from the 2002 DVD. Most of these appear on a second disc, but the movie platter includes a few bits as well. It contributes three trailers for Fellowship - two teaser, one final – as well as a Lord of the Rings trilogy “supertrailer” and videogame trailers for Aragon’s Quest and War in the North. Even though some of these bits repeat on the other platter, that’s a standard DVD, so fans will be happy to see the ads in high-def on this Blu-ray. Over on the second disc, we start with a series of promotional documentaries. 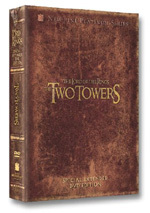 An in-store special created by book publishers Houghton Mifflin, Welcome to Middle-earth In-Store Special runs 16 minutes and 44 seconds. It mixes many film clips with some behind the scenes shots and a series of interviews. In the latter category, we hear from publisher Rayner Unwin, director Peter Jackson, author of "The Lord of the Rings Official Movie Guide" Brian Sibley, conceptual artist Alan Lee, Houghton Mifflin Director of Tolkien Projects Clay Harper, WETA Workshop President Richard Taylor, and actors Cate Blanchett, Ian McKellen, Orlando Bloom, Elijah Wood, and Viggo Mortensen. Probably the best of the disc's documentaries, "Welcome" is also the shortest and the most promotional; it touts Fellowship as "the most anticipated film of all time", which is a crock. However, it includes some good shots from the set, and the chat with Unwin provides some wonderful information. He was involved with the original publication of the Rings series and he adds great notes about its early days. Heck, he even possesses a name that sounds like a Rings character! The 184-second Special Extended DVD Edition Preview looks at the 2002 four-disc release. It quickly discusses the additions to the film and the package’s supplements, so it’s a nice appetizer but nothing terribly compelling. A Behind the Scenes Preview of The Two Towers lasts 10 minutes, 42 seconds and mixes scenes from that film with some interviews. We get notes from director Jackson, producer Osborne, executive producer Mark Ordesky, WETA President Taylor, and actors Wood, Boyd, Monaghan, Miranda Otto, Andy Serkis, Bloom, Mortensen, and Astin. We hear about the movie’s basic plot and learn of some distinctions, including new actors. We also see a little of the creation of some visual effects like Gollum. Why does the 2010 Blu-ray package include “previews” for a movie, a DVD release and a video game that came out years earlier? Because this is literally the same disc that accompanied the 2002 theatrical cut DVD for Fellowship. The Blu-ray just takes the existing platter and plops it in this set; there’s nothing new or different here. Finally, a third disc offers a Digital Copy of Fellowship. With this, you can easily transfer the film onto a computer or portable viewing device. Have a blast! 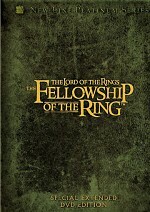 Fans had high expectations for The Lord of the Rings: The Fellowship of the Ring, and the film seems to match them. As a neophyte to the realm, I feel the movie has some minor flaws, but overall it comes across quite well, and it offers an exciting and rich experience. The Blu-ray offers good – though slightly inconsistent picture – along with mostly terrific sound and a moderately superficial but still solid roster of extras. Fellowship comes with my recommendation, as despite some minor visual concerns, this was a fine upgrade over the old DVDs. 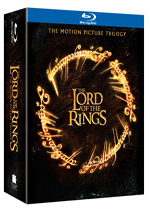 Note that the The Fellowship of the Ring Blu-ray appears only as part of “The Lord of the Rings: The Motion Picture Trilogy”. The nine-disc set also includes the other two movies in the series as well as bonus materials and digital copies of the three flicks. I would assume that the Fellowship Blu-ray will eventually be available on its own, but as of March 2010, New Line has announced no plans to do so.